What's Your Favorite Forgotten Engine? For every and LT1 V8 and SR20 I4 there's an engine lost to history because of its rarity, its strangeness, or the misfortune of being dropped in an appliance. Today is a day of remembrance. What's your favorite forgotten engine? 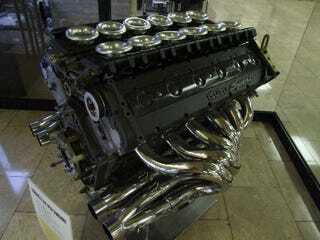 Most people don't realize that Isuzu built a V12 in the early 1990s. The engine was secretly tested by Lotus engineers for use in F1 cars, but didn't earn a place despite doing well enough to earn consideration. The 3.5-liter V12 produced over 700 HP at 13,500 RPM and was even considered for the McLaren F1, before Gordon Murray decided to go with someone more established. It was then transferred to the strange Isuzu Como ute concept, where it was behind the passenger cabin like a couple of plastic seats in a BRAT. From there it vanished, with rumors of it living in one engineer's house. Turn your crank for the forgotten!